Before making them in my kitchen, I had never eaten edible bolognese lasagna outside Bologna. It is such a cliché school dining hall dish that no profit conscious restaurateur would try to make it from scratch. And yet, it is one of the very best pasta you can eat. See how you can do it in your own home while the ragù bolognese is simmering. Authentic lasagna is nothing like regular lasagna served outside Italy. Cooking the meat sauce takes the better part of 4 hours - see my Ragù Bolognese article. 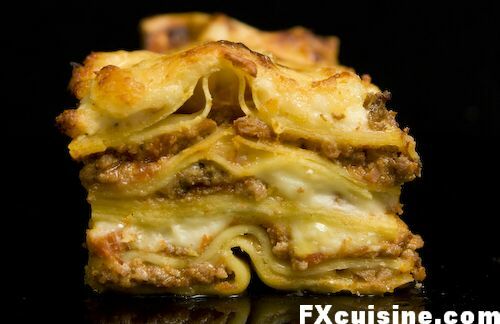 I will start right after you have done your ragù and show you how you can make the lasagna from scratch and turn out memorable lasagnas for your family and friends. You can use make lasagna from regular white flour, but if you have access to durum wheat semolina I recommend you use between 30% and 50% of semolina flour so that the pasta remains hard longer. The quantity of pasta you will need depends more on the size of your dish than on number of guests. 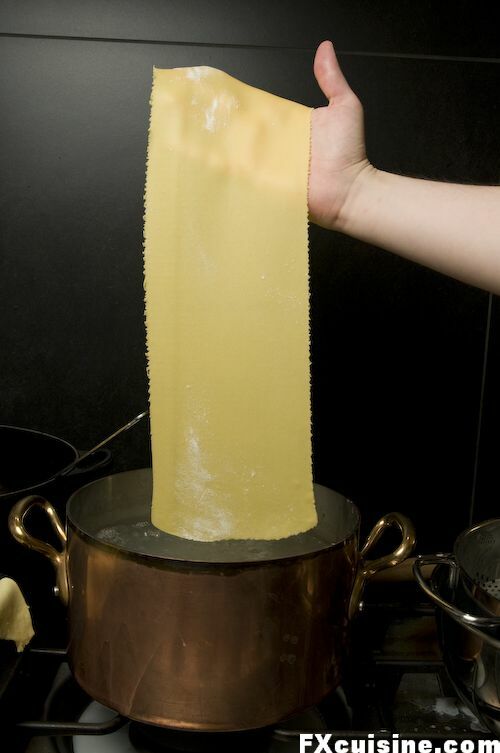 For a large rectangular dish such as the one I used (see below) you can use 4 to 6 eggs' worth of pasta. 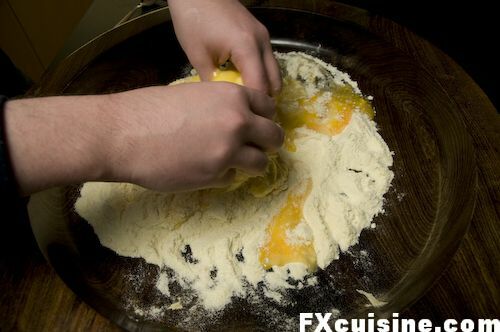 When making pasta Bologna-style, you always start with the eggs and add whatever flour they can absorb. Eggs come in various sizes, so use a little less flour to start with and just add some more until the dough no longer sticks. 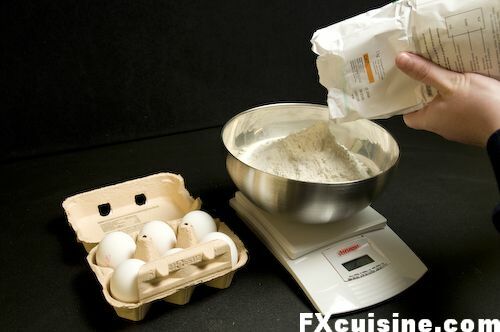 A good rule of thumb is to use 100 grams (3 ounces) flour per egg. Please do yourself a favor and use proper freerange eggs. Whenever I buy service station eggs on the way back home my pasta smells funny. Sift the flours to mix intimately. Do not salt. You will see some recipes with a little water included. Some people add a pinch of saffron powder for a more intense yellow color, others add spinach juice for green pasta. Others still only uses the yolks for snappy, yellow pasta. Start by using whole eggs and no water and once you make this work, you can try the fancier mixes. 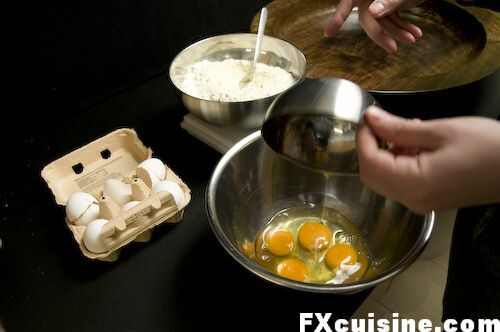 Break the eggs into a bowl and break their yolks with a fork. Beat them a for a few seconds, then pour this into the flour, turning your mound into a volcano. The first time you do this, an egg stream might escape the volcano and run down into your kitchen drawer. This won't happen if you anticipate it, but it's easy to forget how fast beaten egg can flow. Throughly sift the flour or flours together. Do not add salt as it could make unsightly marks in your lasagna. 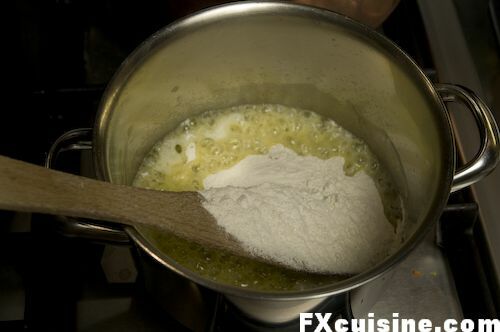 Pour the flour in a small mound on a large wooden table, kitchen top or Moroccan walnut gsâa. Make a large hole in your mound. 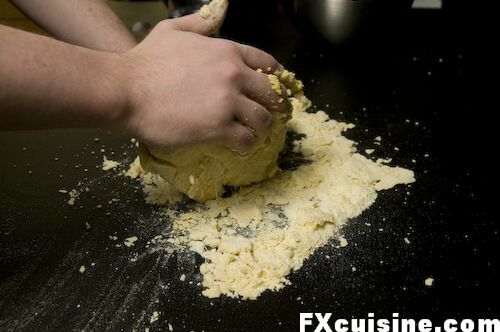 Mix with your bare hands to incorporate all of the egg into the flour. 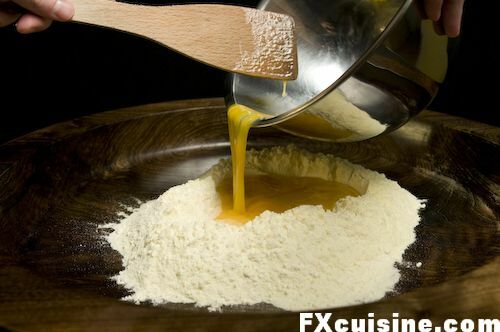 If the mixture is too sticky, add more flour, a pinch at a time. If it is as dry as a cannonball, add a tablespoon water. But don't go too far, this thing is like flying a helicopter or trying to set the shower temperature in a layover motel - a little change can propel you way in the opposite direction. Show the lasagna who's boss. 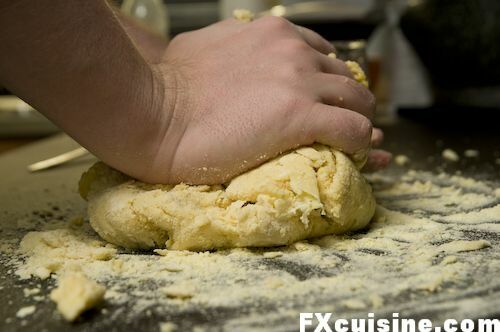 When your dough starts getting smooth, go wash your hands above a sink. Do not try to incorporate the tiny bits of pasta you get when rubbing your palms together nor the pasta crumbs on the table. 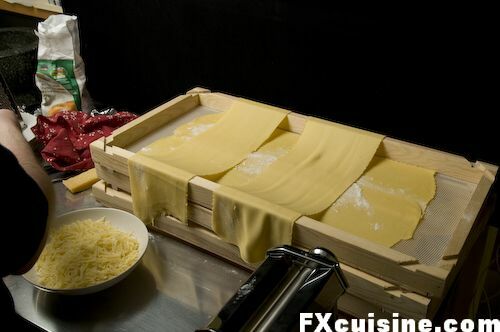 They have different properties than the rest of the dough and will tear your pasta sheets. You won't waste money by throwing them into the bin - quite the opposite in fact as they might waste the entire batch. The dough should not stick. If in doubt, keep it a little too dry, since the water will hydrate the dough some more as it rests. Wrap the dough in foil or plastic so that it won't grow a crust and leave in the fridge for 30 minutes or so. 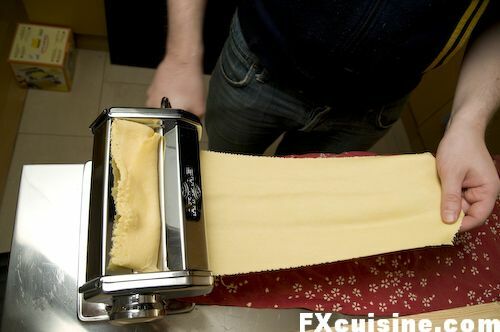 I'm going to show you how to make lasagna using a home pasta machine. I bought my first machine 5 years ago, assuming I would not use it that often and wondering if that was a good buy. It's a great buy! Italian restaurants all over the world use just the same machines, often hand-cranked and not bigger. Of course you can do it mama-style with a large stick, like I did my Pumpkin Tortellini. These little machines go for about $50 on Amazon.com and are an almost foolproof way of making great fresh pasta. The principle is simple. 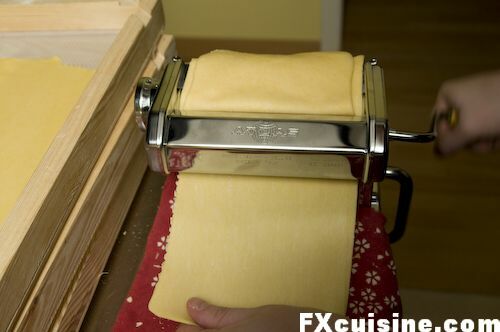 Cut an apricot-sized ball of dough and set your pasta machine on the largest thickness setting. 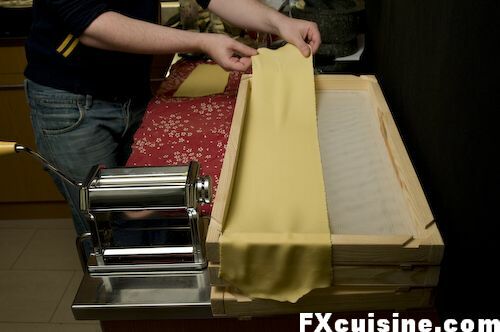 Laminate the pasta by turning the crank, then decrease the thickness by turning the wheel on the opposite side of the pasta machine, fold your pasta sheet in half and pass it through the machine again. Continue until you have reached the thickness you want. This repeated lamination turns the dough into a silky, smooth sheet by stretching the gluten strands. It is quite amazing! I recommend you do not make your lasagna too thin considering what will happen to it later. Next-to-next-to-last (antepenultimate) thickness is best. There we are - a beautiful, 2-feet-long lasagna. Here I rest them on special pasta drying trays, but people routinely hang them from a mop handle set horizontally across two chairs. The idea is to dry the pasta a wee bit before boiling. 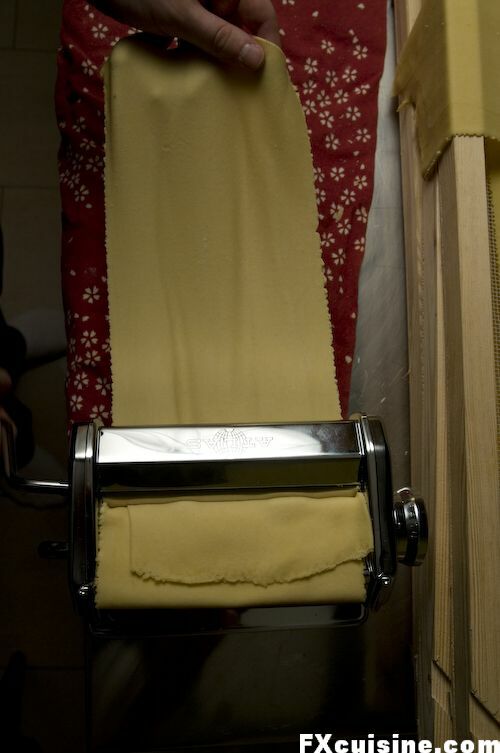 Some more pasta can be rested across the other ones, making sure they don't touch each other. 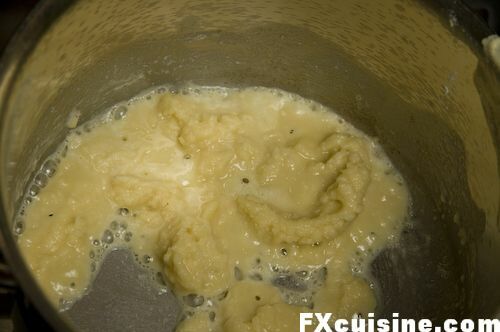 It is not a great idea to cover the lasagna with flour to prevent it from sticking, as the flour will itself stick to the pasta as soon as you plunge it in the boiling water. 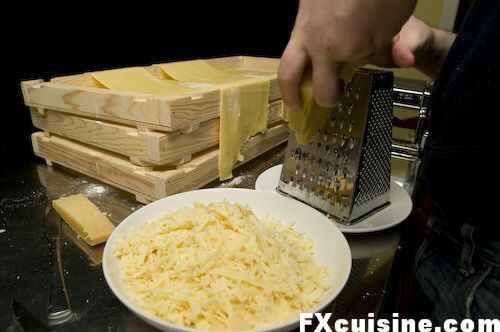 Grate the best parmesan cheese you can find, about two cups. Here I used a legendary Parmesan made from red cows' milk. 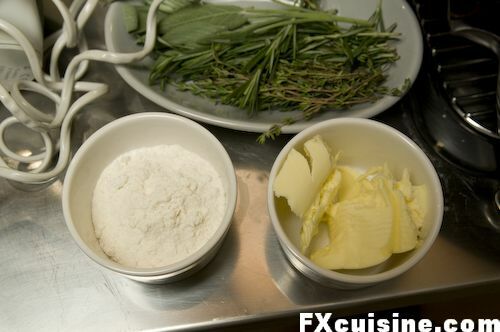 ... melt the butter in a saucepan over medium heat, and combine with the flour. Mix well until all the flour has been incorporated. Let it bubble until the mixture starts to color slightly. 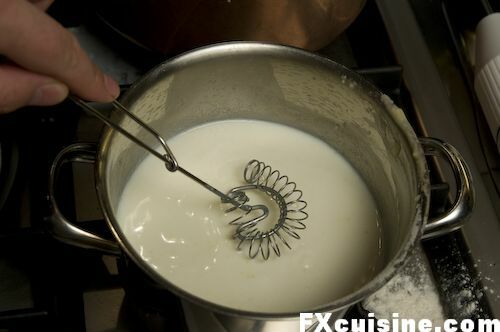 This is a roux, basically we gorge each of the tiny flour particles with fat so that we can use it to thicken the sauce. ... and mix well with a whip. Simmer until it thickens. 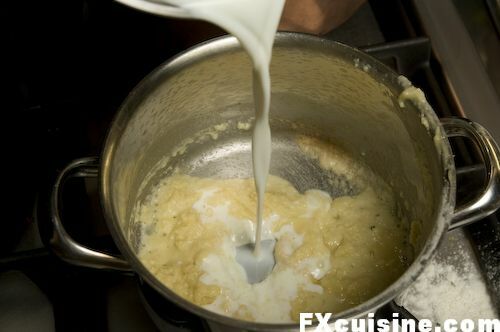 Voilà, you have made a béchamel.